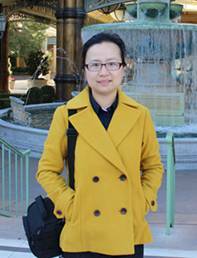 She is interested in developing efficient algorithms and software for computational problems in molecular biology and biomedine with Machine Learning and Data Ming approaches. In particular, her research includes biological sequence analysis and classification, non-coding RNA identification and gene regulatory network construction for complex diseases. l “Computational prediction of type III secreted effectors from gram-negative bacteria”, the National Natural Science Foundation of China (Grant No. 61003093), USD 32K, 1/1/2011 - 12/31/2013. l “Large scale protein sequence classification based on machine learning methods”, the Science & Technology Program of Shanghai Maritime University (Grant No. 20110009), USD 17K, 1/1/2011 - 12/31/2012. l “Study on the classification of biological sequences”, the Science Foundation for The Excellent Youth Scholars of Shanghai Municipality, USD 5K, 7/1 /2010 - 6/30/2012. 7. Yang Yang and Bao-Liang Lu, “Protein subcellular multi-localization prediction using a min-max modular support vector machine,” International Journal of Neural Systems, vol. 20, No. 1, pp. 13-28, 2010. 8. Yang Yang, “Computational prediction of type III secreted proteins using labeled and unlabeled data,” International Journal of Infectious Diseases, vol. 14, suppl.2, pp. 37, 2010. 16. Yang Yang, Bao-liang Lu and Wen-Yun Yang, ``Classification of protein sequences based on word segmentation methods,'' Proc. of the 6th Asia Pacific Bioinformatics Conference (APBC 2008), Kyoto, Japan, pp. 177-186. 18. Wenyun Yang, Bao-Liang Lu and Yang Yang, “A Comparative study on feature extraction from protein sequences for subcellular localization prediction,” Proc. of 2006 IEEE Symposium on Computational Intelligence in Bioinformatics and Computational Biology (CIBCB 2006), Toronto, Ontario, Canada, pp. 201-208. 19. Yang Yang and Bao-Liang Lu, “Prediction of protein subcellular multi-locations with a min-max modular support vector machine,” Advances in neural networks – ISNN 2006, LNCS, vol.3973, pp.667-673, 2006. 20. Yang Yang and Bao-Liang Lu, “Extracting features from protein sequences using Chinese segmentation techniques for subcellular localization,” Proc. of 2005 IEEE Symposium on Computational Intelligence in Bioinformatics and Computational Biology (CIBCB 2005), San Diego, California, USA, pp 288-295.